“Conifer” redirects here. For other uses, see Conifer (disambiguation). Conifer is a Latin word, a compound of conus (cone) and ferre (to bear), meaning “the one that bears (a) cone(s)”. 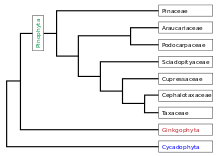 According to the ICN, it is possible to use a name formed by replacing the termination -aceae in the name of an included family, in this case preferably Pinaceae, by the appropriate termination, in the case of this division ‑ophyta. Alternatively, “descriptive botanical names” may also be used at any rank above family. Both are allowed. All living conifers are woody plants, and most are trees, the majority having monopodial growth form (a single, straight trunk with side branches) with strong apical dominance. Many conifers have distinctly scented resin, secreted to protect the tree against insect infestation and fungal infection of wounds. Fossilized resin hardens into amber. The size of mature conifers varies from less than one meter, to over 100 meters. The world’s tallest, thickest, largest, and oldest living trees are all conifers. The tallest is a Coast Redwood (Sequoia sempervirens), with a height of 115.55 meters (although one Victorian mountain ash, Eucalyptus regnans, allegedly grew to a height of 140 meters, although the exact dimensions were not confirmed). The thickest, or tree with the greatest trunk diameter, is a Montezuma Cypress (Taxodium mucronatum), 11.42 meters in diameter. The largest tree by three-dimensional volume is a Giant Sequoia (Sequoiadendron giganteum), with a volume 1486.9 cubic meters. The smallest is the pygmy pine (Lepidothamnus laxifolius) of New Zealand, which is seldom taller than 30 cm when mature. The oldest is a Great Basin Bristlecone Pine (Pinus longaeva), 4,700 years old. The order of priority of photosynthate distribution is probably: first to apical growth and new needle formation, then to buds for the next year’s growth, with the cambium in the older parts of the branches receiving sustenance last. In the white spruce studied by Fraser et al. (1964), the needles constituted 17.5% of the over-day weight. Undoubtedly, the proportions change with time. Wind and animals dispersals are two major mechanisms involved in the dispersal of conifer seeds. Wind bore seed dispersal involves two processes, namely; local neighborhood dispersal (LND) and long- distance dispersal (LDD). Long-distance dispersal distances ranges from 11.9–33.7 kilometres (7.4–20.9 mi) from the source. The bird family, Corvidae is the primary distributor of the conifer seeds. These birds are known to cache 32,000 pine seeds and transport the seeds as far as 12–22 kilometres (7.5–13.7 mi) from the source. The birds store the seeds in the soil at depths of 2–3 centimetres (0.79–1.18 in) under conditions which favor germination. 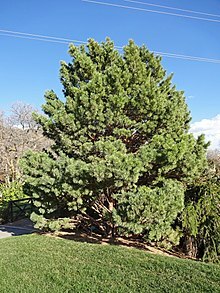 Radiata pine was introduced to Australia in the 1870s. It is “the dominant tree species in the Australian plantation estate” – so much so that many Australians are concerned by the resulting loss of native wildlife habitat. The species is widely regarded as an environmental weed across southeastern and southwestern Australia  and the removal of individual plants beyond plantations is encouraged. Conifers – notably Abies (fir), Cedrus, Chamaecyparis lawsoniana (Lawson’s cypress), Cupressus (cypress), juniper, Picea (spruce), Pinus (pine), Taxus (yew), Thuja (cedar) – have been the subject of selection for ornamental purposes (for more information see the silviculture page). Plants with unusual growth habits, sizes, and colours are propagated and planted in parks and gardens throughout the world. ^ Lott, John N. A; Liu, Jessica C; Pennell, Kelly A; Lesage, Aude; West, M Marcia (2002). “Iron-rich particles and globoids in embryos of seeds from phyla Coniferophyta, Cycadophyta, Gnetophyta, and Ginkgophyta: characteristics of early seed plants”. Canadian Journal of Botany. 80 (9): 954–961. doi:10.1139/b02-083. ^ “Pinidae (conifers) description – The Gymnosperm Database”. Archived from the original on 2016-02-20. ^ Wassilieff, Maggy. “Conifers”. Te Ara – the Encyclopedia of New Zealand updated 1-Mar-09. ^ Dallimore, William, Albert Bruce Jackson, and S.G. Harrison. 1967. A handbook of Coniferae and Ginkgoaceae, 4th ed. New York: St. Martin’s Press. xix, 729 p.
^ a b “South Island wilding conifer strategy”. Department of Conservation (New Zealand). 2001. Retrieved 2009-04-19. ^ “Blue Mountains City Council – Fact Sheets [Retrieved 1 August 2015]”. ^ Farjon, Aljos (2010). A handbook of the world’s conifers. Brill Academic Publishers. ISBN 978-9004177185. Knee, Michael. “Gymnosperms”. Retrieved 14 January 2016.